Dedicated to my long-time friend, Jennifer Zorek-Pressman, who introduced me to the Bluesmart carry-on suitcase that you can control with an app. 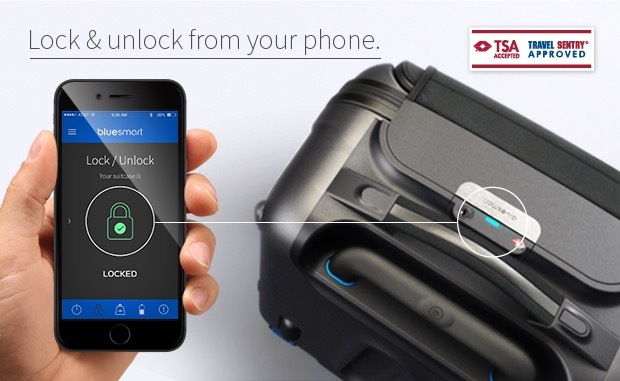 You can lock and unlock it, weigh it, track its location, be notified if you are leaving it behind and find out more about your travel habits. You can also charge your phone six times over with a built-in battery. Thank you Jennifer, this is a real find. It’s a little pricey at $235, but it really does a lot. The Bluesmart carry-on is currently raising money on Indiegogo for development. I will be one of the first to buy this luggage. Click here if you want a shortcut to see the Indiegogo campaign. This entry was posted in digital, senior lifestyle, tech and tagged Bluesmart: World's First Smart, Connected Carry-On | Indiegogo by loiswhitman. Bookmark the permalink.